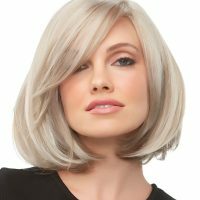 With long layers falling below the shoulder, Minka Wig by Jon Renau is the style that combines romantic length with playful textures. The SmartLace hairline and monofilament cap look as natural as they feel. Gallery Model #2 is wearing 14/26S10 Light Gold Blonde & Medium Red Gold Blonde Blend, shaded with Light Brown.